Offering Conventional, Minnesota Housing (MHFA), Rural Development, Iowa Finance Authority (IFA), HomeReady, Fannie Mae, FHA, VA, and more. With so many loan options, "someday" could be sooner than you think. Contact your local lender to get started! Are you a potential first-time homebuyer? If yes, GREAT! Keep reading. If you've bought a home before, click here to learn more about our other loan offerings for you. Do you think you can afford your own home? If your answer is "YES," great! You should talk to one of our mortgage lenders today. Find your local lender here. If your answer is "NO,"
Why don't you think you can afford one? Below are three of the most common answers we hear, with good news for you on each! "I have too low of credit score..."
You don't need a 700+ credit score to buy a home. We have loan options for lower credit, and we even have options to help build your credit! "I don't have enough for a down payment..."
While having a 10%+ down payment is great, it's not required for all home loans. We have loan options that require little to no money down, plus there are many down payment assistance options available to those who qualify! "I don't make enough money"
There are many loan options created specifically for those with lower incomes. You may be more well-off than you think! 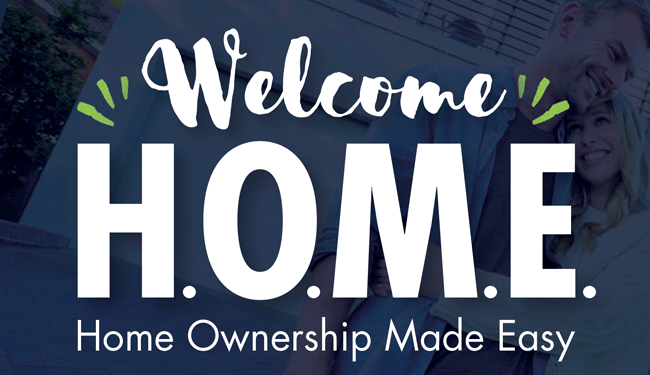 At Home Federal, we work hard to get you into your first home sooner than you think. Find your local lender and contact them for an appointment today! All applications are subject to underwriting guidelines and approval. This does not constitute an offer to lend. Not all applicants will qualify for all loan products offered.